To contribute to the development of a commercial market for quality-verified solar lanterns and SHS is the overall goal of the Lighting Africa – Tanzania project .By end 2019 access to cleaner and safer off-grid lighting and energy for 6.5 million people in Tanzania is their target. Focusing on predominantly low income households and micro businesses which are among the population who are at the bottom of the pyramid. After conducting a policy environment assessment and market research in 2010 and 2013 respectively. Their program activities kicked-off in 2017. This provided insight into supply chain channels, consumer behavior and the policy framework in Tanzania, and also informing the design of their program. Companies in the off-grid lighting space are whom they will work with, such as local distribution companies and global manufacturers of high quality products in order to establish new market channels in Tanzania.They will also work with a range of other intermediaries and stakeholders which includes NGOs such as the Ministry of Energy , and many other development partners – to accelerate the adoption and entry of quality-verified products. The inability of consumers to distinguish between good and poor quality products is a key market barrier. Confidence of the consumer is eroded by poor quality products consumer Tanzania Bureau of Standards (TBS) and Lighting Africa have been working to integrate the Lighting Global Quality Standards into their regulatory framework. Until standards have been adopted They will continue to provide guidance to (TBS) .To mitigate the impact of substandard products and counterfeits in the market They will also work with the Tanzania Renewable Energy Association (TAREA) and Fair Competition Commission (FCC) .Tanzania Bureau of Standards (TBS) and Lighting Africa have been working to integrate the Lighting Global Quality Standards into their regulatory framework.Until standards have been adopted they will continue to provide guidance to (TBS). 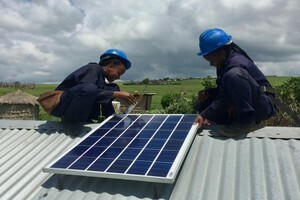 Tanzania has embarked on construction of mini-girds of solar-hybrid to boost electric power output to meet the rising demand of electricity in the country. On a cluster of islands in Lake Victoria a phase one of the projects are moving swiftly says RP Global an independent renewable energy developer and majority shareholder of Jumeme. Phase one includes construction of 11 new independent mini-grids equipped with battery storage technology, to bring 24/7 electricity to 20 villages with a population of 80,000 people are being constructed. Financed by the European Union (EU) through the ACP-EU Energy facility, the phase one is scheduled for commissioning in June 2019. The second scaling phase of the project is up coming to build 11 more mini-grids which are expected to electrify a population of 106,000 people in more than 23 villages bringing energy services to each and every one of them. Director of RP Global Africa, Leo Schiefermuller stated that solar hybrids mini-grid are comparatively the least-cost electrification option, the pay-as-you-go model of Jumeme makes electricity consumption for customers more affordable Many of the remote communities in Tanzania still do not have access to electricity especially in rural areas. ", said the Director. In Tanzania our regions of operation show some of the lowest rural electrification rates, ranging between 3% and 5%. The population is widely dispersed across numerous distant villages and small towns, in these areas making it hard to connect them through the national grid," said Schiefermuller. The financial support of the ACP-EU Energy Facility and Tanzania's Rural Energy Agency (REA) made the Jumeme venture a reality that is to supply one million Tanzanians with high quality and reliable electricity by 2023. To meet the rising demand of electricity in the country. Tanzania has embarked upon the construction of solar-hybrid mini-grids to boost the output through the Jumeme Rural Power Supply Ltd.